If your minutes were money, would you like how you’re spending yours? 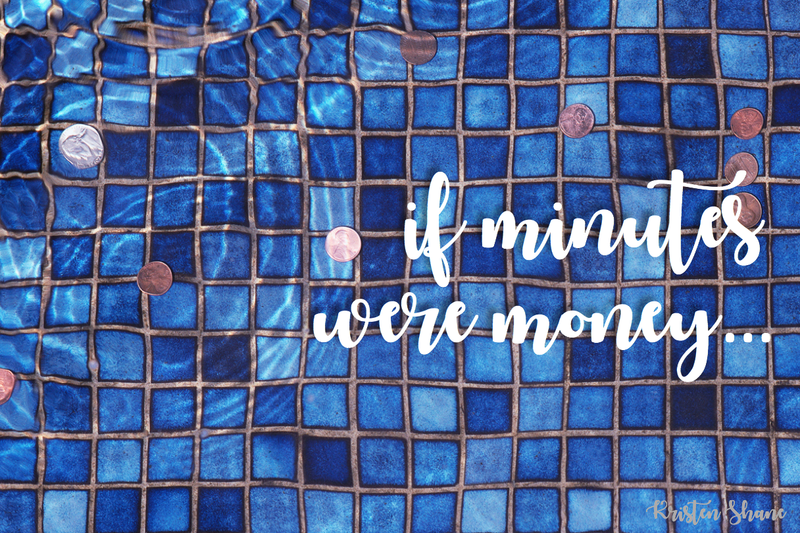 If each minute were a dollar, you’d have $525,600 each year, and a new $1,440 every single day. But am I caring for my minutes the same way I would care for that much cash? For a college kid that doesn’t currently have a job, I’d love to be making $60 every hour. I’ve been thinking about this concept recently, the value of time, and thinking about it has helped me figure out how I want to spend each of my minutes, which are truly so valuable. With any major responsibility, like school, jobs, sports, other activities, or all of the above, I think we all easily find that there are many things in competition for our limited time. With each minute, you probably aren’t making the conscious decision each minute that this is how you want to spend that minute, but it sure would be nice if we could. Some of the time,though, we do get to make the decision, whether we realize the value of our seconds or not. When thinking about this concept, it mostly makes me wonder about all the minutes outside of the unmistakably valuable things, like class time, homework, studying, and church time… Those things I know are important and worthy of my minutes. It’s the rest of the time, and all the other things that eat it up, that gets me wondering. In college, there seems to be a lot of “free time”, since I only have class for a few hours each day, instead of full 8-hour high school days. But in reality, most of my time isn’t free at all. There’s some general estimate, the 80/20 rule (or Paretto principle, as I learned it’s called here), that 80% of the outcomes result from 20% of the effects. I’ve also heard this interpreted that you learn 20% of what you need in class, and have to learn the rest on your own. Without worrying about the exact principle too much, I mean to say that in college, you have to commit way more time outside the classroom than you do inside it, if you want to be successful. This means making the decision to “spend” your “free” time towards classwork, even when it seems you’re done for the day. It means you have to make the decision to put your money in the “homework” piggy bank instead of the “Netflix” one, (sad, I know). Trying to balance the school time, on top of everything else college has to offer, is a lot to “budget” into my day. Honestly, this whole thing goes over my head a little, because I can’t control every minute as easily as I can money, but being aware of this does help me place more value on the minutes I more easily get to choose, and that’s the important thing for me. The other point with this I’d like to make is in the minutes I spend on my phone. Blogging has helped create a positive way for me to use my time, in reading other blogs and in writing my own. On my other social media, like Facebook, Instagram, and Twitter especially, I’ve been trying to be conscious of the time I spend on them. After realizing that I don’t really benefit from Twitter anymore, in comparison with the amount of time I was spending on it, I deleted the app from my phone, and that alone made a positive difference for me. I don’t think social media is all bad, and I don’t like the extent of the stereotypes surrounding my generation and our phones, but once I actually thought about the amount of time I was spending absentmindedly scrolling through things that aren’t beneficial or interesting to me, I wanted to make a change, even if it was a small one, (like I’ve said before, it really is the little things). I still use social media every day, and the change may not even be apparent to my friends, but I’m personally conscious of it and have tried to limit the amount of time I scroll through feeds, but instead try to go on with a purpose, or to read or look at specific things. I think it’s helped me simply to be aware of it, and I’m still making strides to not let certain things waste my minutes, if I can help it. Why Aren’t College Students Graduating in Four Years? Kristen, you make some good points about spending your minutes. That 80/20 rule not only applies to school but also shows up after school. The problem there is that 20 % of the people end up doing 80% of the work the rest are just biding their time and riding along with those doing the real,work. Keep up the blogs, they show some real perspective on life in general.